Stems aquatic, rooted in shallow water, the horizontally submerged branches radiating from the base of the scape. Leaves alternate, one-fourth to two-thirds of an inch long, three-forked at the base, the divisions again two or three times divided into linear, flat, bristly-serrulate segments without bladders. Other branches or portions of branches usually bear shorter, rootlike leaves with capillary segments and a few large bladders. The flower-bearing scape naked or with one to several minute scales, 2 to 8 inches high and bearing one to four flowers on slender pedicels one-fourth to three-fourths of an inch long. Calyx two-lobed. Corolla yellow, strongly two-lipped, the upper lip broadly triangular, about one-third of an inch broad, the lower lip slightly three-lobed and about one-half of an inch broad with a prominent palate on its face. Spur pointed, about as long as the lower lip. In midsummer, when the plant is in flower, the leafy stems produce at their tips numerous conspicuous, obovate, velvety winter buds which afford the chief means of propagation. Frequent in shallow water of slow streams, ponds and bogs, Newfoundland to British Columbia south to New Jersey, Indiana and California. Flowering in July and August or as late as early September. 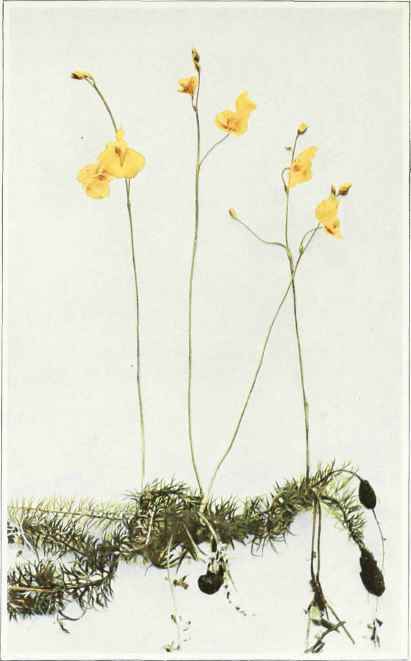 The Greater Bladderwort or Hooded Water Milfoil (Utricularia macrorhiza LeConte) is perhaps the most abundant species of the group throughout most parts of the State. It has free-floating stems horizontally spreading beneath the surface. Leaves finely divided, but not flat, bearing numerous small, conspicuous bladders. Scape stout, 3 to 20 inches high, with four to eighteen flowers, pedicels one-fourth to two-thirds of an inch long, becoming longer and recurved in fruit. Corolla yellow, three-fourths of an inch long, strongly two-lipped, the lower lip a little longer and much broader than the upper and with a spreading, undulate, slightly three-lobed border and a prominent palate; spur shorter than the lower lip, subulate and upwardly curved.